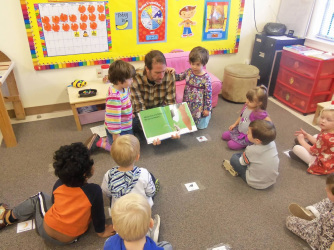 INTEREST CENTERS: Centers of interest in each classroom reflect the emerging interests and needs of individual children within the larger group of children. Teachers work to facilitate the introduction and continuation of activities designed to introduce and/or further needed skills that are embedded into both teacher-directed and child-directed activities. Individual lesson plans reflect: a teacher-planned, child-driven thematic plan with additions, changes and embellishments in each center to further emphasize ideas and concepts needed and/or wanted by the children. The Day School offers an eclectic approach to learning that includes approaches and materials known by the divergent members of the staff. These approaches and materials may include, but are not limited to the following: Montessori, High Scope, Everyday Math, The Wright Group, The Creative Curriculum, and Handwriting Without Tears. We also adhere to the Kentucky Early Childhood Standards as set forth by the Kentucky Department of Education. Each classroom is planned around the theory of Developmentally Appropriate Practices (DAP) for individual children. skills involved in abstract thinking. To feel and demonstrate self-confidence and self-esteem. To be able to use words in a way appropriate to the child’s age to share feelings and thoughts, express needs and wants, and solve conflicts. To be self sufficient: in dress, in hygiene, in meals, and in self-care. To begin to understand what it means to be and have a friend. large and small muscle groups respond to commands. To develop the skills and understandings necessary to be able to control one’s own behavior. To be able to make appropriate choices for one’s age and developmental level. To be cognitively challenged in age appropriate ways. provide opportunities to meet and work with other parents and teachers who have as their common concern the interests and needs of the pre-school and kindergarten child. provide quality child care while parents pursue work or other interests. provide opportunities to grow in the understanding of child development through a planned educational program. develop opportunities for families of Day School children to come together in a fun/play environment to increase their Day School community spirit.